Lambert & Rehbein were commissioned by the Department of Transport & Main Roads (Metropolitan) to undertake the Option Analysis and Business Case stages of the proposed pedestrian / cycle connection between the Gateway Bridge and the Kedron Brook Wetlands Bikeway at Albert Bishop Park, to complete a missing component of the Moreton Bay Cycleway (MBC). 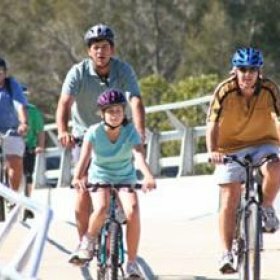 The proposed connection is planned to accommodate both pedestrian and cycle movements for continuity, as the Kedron Brook Wetlands Bikeway and the Gateway Bridge include pedestrian / cycle facilities. During the first stage of the project five broad options were developed for the proposed pedestrian / cycle path, and were discussed with the key stakeholders and reference group, followed by an initial desktop assessment. During the process of data collection and collation, and consultation with external stakeholders, the five options were narrowed down to two viable options based on physical constraints, infrastructure costs, and reference group feedback. The assessment of what could be achieved by the time that the duplicated Gateway Bridge was operational indicated that a particular route was the optimum solution for this significant link. The Business Case included stakeholder and reference group consultation during the development of the preliminary detail design of the recommended route. A risk register and P90 cost estimate was developed for the preferred route.